Malaysian racing driver, Jazeman Jaafar, will be returning to the cockpit for the sixth round of the Formula Renault 3.5 Series this weekend, with the World Series by Renault event taking place at the popular Nurburgring circuit in Germany. Jazeman has had a busy schedule in the last couple of weeks. He returned from the Moscow round of the FR3.5 Series and prepared for a sportscar test with HTP Motorsport. 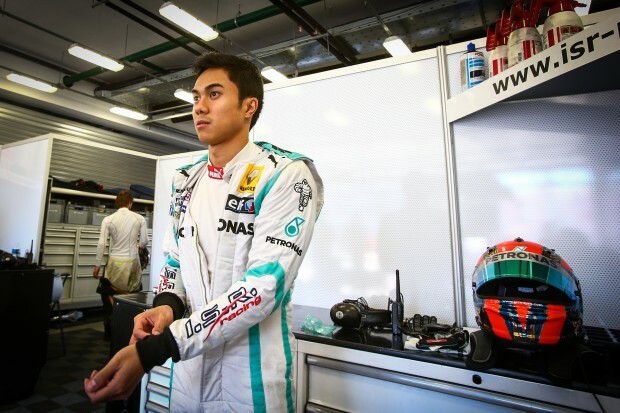 After a successful day of running at Spa-Francorchamps in Belgium Jazeman traveled back to London and on to Silverstone to join the MERCEDES AMG PETRONAS F1 team for the British Grand Prix. The World Series by Renault event at Nurburgring starts on Friday 11th July with two practice sessions for Jazeman and the Formula Renault 3.5 Series. On Saturday morning qualifying for the first of the two races takes place, with the first race in the afternoon. Qualifying and the second race are on Sunday 13th July. Check TV listings for local times of showing on Eurosport.